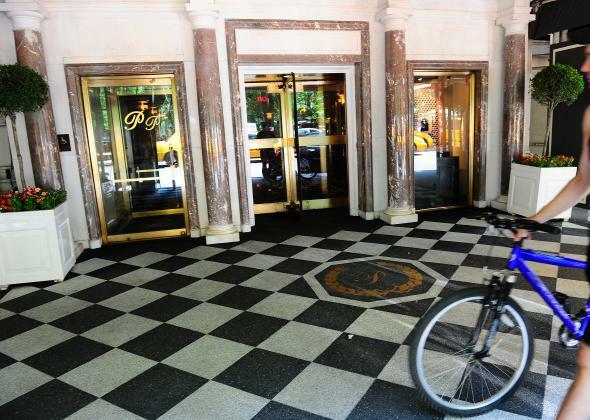 Most expensive apartment in New York: Someone is paying $500,000 a month for this Pierre Hotel rental. Manhattan’s Pierre Hotel, home to the $500,000 apartment. New York City’s priciest apartment has found a mysterious tenant. The rental, the entire 39th floor of the luxury Pierre Hotel on the Upper East Side, was recently leased at its full asking price of $500,000 a month to an anonymous renter through the end of December, according to its listing agents. The apartment spans 4,786 square feet with six bedrooms and six-and-a-half bathrooms, and overlooks the George Washington Bridge, Central Park, and the reservoir. It has been on the market since the end of October and was also available to rent out separately as the two-bedroom Presidential Suite ($20,000 per night or $400,000 per month) and other additional rooms ($20,000 to $40,000 per month). Listing agents Therese Bateman and Andres Perea-Garzon of Town Fifth Avenue did not disclose the tenant’s name or citizenship, but did tell the Wall Street Journal that the property saw great interest from Europe, the Middle East, and the British Commonwealth. The same tenant also opted to reserve the hotel’s Getty Suite on the 10th floor ($8,000 a night or $150,000 a month) for guests. How crazy expensive is the $500,000 a month apartment? According to Forbes, the most expensive apartment for sale in New York City is the 12,394-square-foot triplex at 530 Park Ave., with an asking price of $130 million. So, if you hung onto the $500,000 apartment for 21 years, it would be as expensive as the most expensive apartment for purchase (but also only about a third as big). And in September, Page Six reported that Robert De Niro had moved into an entire floor of a tower at 15 Central Park West for $125,000 a month. That space was bigger than the $500,000 apartment at 6,000 square feet, and only a quarter of the price. So, you know, someone clearly got ripped off by their broker.